Outside the safety of the kelp forest, California sea otters are being picked off by sharks. A plump, healthy-looking sea otter has stranded itself on a sandy beach at the northern end of Monterey Bay, California. Sea otters only rarely, if ever, come ashore, so its presence is a sign that something has likely gone awry. Yet unlike the sea otters that have been found starving and emaciated on the beaches farther south, what’s wrong isn’t obvious at first. But Teri Nicholson, a senior research biologist at the Monterey Bay Aquarium, knows exactly what is to blame. As a population, California sea otters are something of a success story. At the turn of the last century, scientists thought that hunters had killed the last of them for their lush pelts. Then, in 1938, about 50 were discovered off Big Sur, in central California. Protected under the US Marine Mammal Protection Act and the Endangered Species Act, the otters have made a comeback. For decades, their numbers have mostly increased, swelling to 3,200 individuals. But now their range appears to be constrained. The otters can’t seem to survive farther north than Santa Cruz or south of Santa Barbara. Their burgeoning numbers and restricted territory have led to overcrowding and, in some cases, starvation and death. For the population to continue to grow, Monterey Bay Aquarium scientists believe the animals must expand into new territory. Yet the sea otters seem stuck where they are. Nicholson, who has spent the past 25 years studying sea otter population trends, suspects that healthy-looking stranded sea otters hold the key to understanding the population’s confinement. “When you look through their remarkably thick, dense fur, you find this penetrating laceration,” she says. It’s the result of a white shark bite. Typically, one bite is all a shark takes to kill a sea otter. For a white shark looking for blubber-rich seals, a sea otter is just an unappetizing hairball. But to the otters, the sharks’ intentions are irrelevant—they still end up dead, or wounded and in need of rehabilitation. In a recent study, Nicholson trawled through 30 years of sea otter stranding records, accounting for 725 animals, and found that the sharks are effectively keeping the sea otters hemmed in. Within the sea otters’ densely populated core range, 63 percent of strandings are due to emaciation. Yet at the edge of their range, shark bites cause the largest proportion of strandings. But what accounts for the prevalence of shark-related strandings in some places but not others? According to Nicholson’s new research, the answer seems to be kelp, or the lack thereof. Kelp forests are typical habitat for sea otters. But by comparing strandings against a map of California’s dwindling kelp forests, she found that shark bites are most common where kelp is scarce. Scientists are not yet sure exactly how kelp safeguards the otters against shark bites. Nicholson, for one, thinks the sharks simply don’t see otters that are hidden amid the foliage. Otters that stray into kelp-free spaces, by contrast, are more likely to be spotted by hungry white sharks. Shark researchers from the aquarium are in the early stages of field research exploring the relationship in more detail. Yet if sharks make leaving the safety of the kelp too daunting for the sea otters, what can be done to help bolster their numbers? Packing them up and moving them is an option, though not an ideal solution, says Andy Johnson, the aquarium’s sea otter research and conservation program manager. Doing so would require approval from the US Fish and Wildlife Service, which oversees the otter population as a threatened species under the Endangered Species Act. Though, Johnson adds, the sea otters’ population is nearing the number needed for the species to be delisted. Johnson says what he really wants is “to see an ecosystem-wide recovery, with sea otters repopulating areas throughout California.” And for that, sea otters could use more kelp in which to hide. Madeline Bodin grew up sailing and fishing off New York’s Long Island and later was a frequent freelance contributor to the science section of the region’s daily newspaper, Newsday. Today, she lives in southern Vermont, where she writes about science and the environment for a variety of publications. 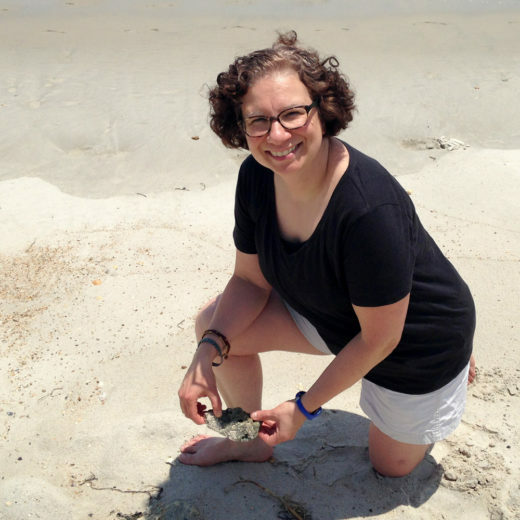 She was a COMPASS media fellow at the Society for Marine Mammalogy’s 2015 conference. Cite this Article: Madeline Bodin “Sea Otters Are Walled in by Hungry Sharks,” Hakai Magazine, Mar 16, 2018, accessed April 25th, 2019, https://www.hakaimagazine.com/news/sea-otters-are-walled-in-by-hungry-sharks/.